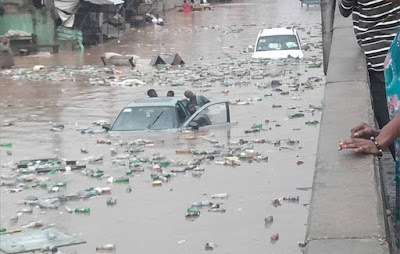 Someone might argue that our national emergency preparedness is appalling, saying 'I tire for Nigeria. If we have emergency responders in those villages, the deaths could have been avoided.' Well maybe so, or so I thought until I read how 31-year-old Jerome Moody died in a pool party organized by lifeguards in New Orleans, Louisiana to celebrate a summer where no one had drowned at any of the city's pool. How can anyone drown in a party organized by lifeguards? Some will say it is home trouble, but I know he did not drown by falling into water, he drowned because he remained under. We have been experiencing a flood of electoral manipulation for so many years. The ruling party since independence has always been accused of manipulating the electoral umpire and security agencies. 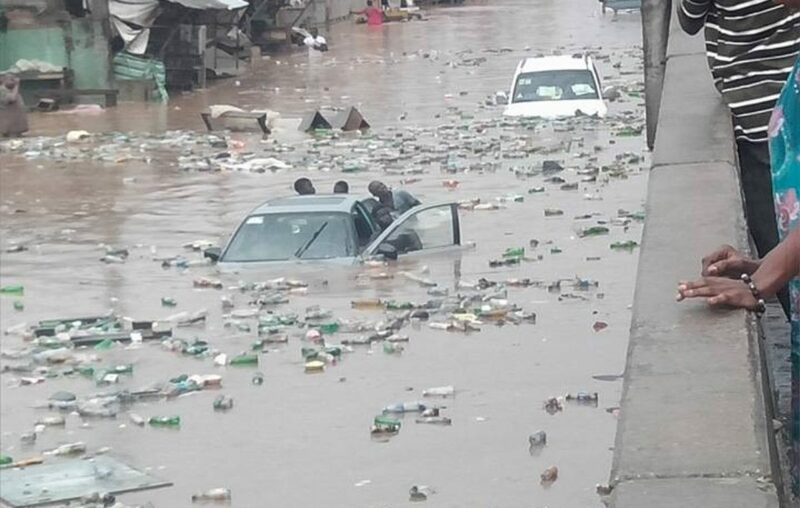 Everyone knew we will drown unless we swim our way out and the Ekiti and Osun elections were like lifeboats. Instead of saving ourselves, we chose to remain in the flood of electoral manipulation and it is drowning us as a nation. Proverbs 24:16 says 'For a just man falls seven times and rises up again.' As we celebrate our 58 Independence Anniversary tomorrow, we need to rise up from the flood before we drown as a nation. Okay, I can understand why 'being born there' is pivotal to influencing opportunities outside Nigeria, but can't understand how we have taken the concept of 'being born there' to a whole new level in Nigeria. Until recently, when appointments are made in Nigeria, many people will give a perfunctory consideration to the state of origin of the appointee but now, if there is any federal appointment, it is followed by a vibrant debate about where that person was born. It got me thinking that the way we are going, some people will start strategizing for their children to be born in the section of Nigeria where they think they will have an advantage. 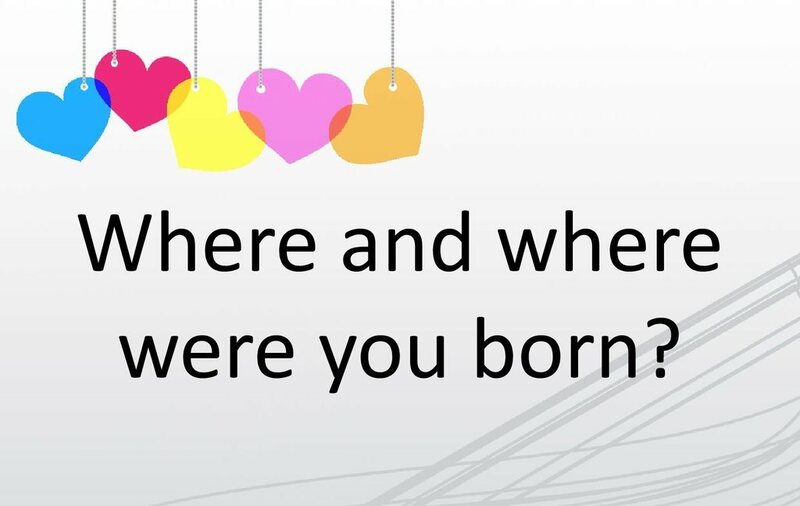 How can we be one people and be focusing on 'this man or this woman was born there?' Why should any government be feeding the narrative of sectionalism or ethnicity? Why can't we appoint people irrespective of where they were born in Nigeria? We are short changing ourselves. I was thinking this morning.....about couples, closeness and the 'and-co' look. While chatting with a friend on our way back from lunch last Monday, he mentioned that the wife was taking him out that evening in celebration of their 25th wedding anniversary. being together for 25 years is no mean feat. As my friend spoke, my mind played back and recalled the gist of past conversations I have had with him about his social outings and connecting the dots revealed he was most times with the wife at these outings. It was obvious that you hardly can separate my friend from his wife in the social space. As I smiled at their time-tested relationship, I remembered an incident that occurred in my early years of working as a contractor personnel in one of the Multinational Oil Companies in Warri. I had this boss then that work so late that real work, for him, starts after 5pm. he was feared by everyone for his bullish approach to work. he will work till about 10pm before closing for the day. One evening, a colleague of mine, named Wale, had to leave at about 6pm. Not long after, the boss came out from his closed office looking for Wale and hoping to get a vital information from him. Wale, unfortunately had closed for the day. He screamed, 'Where is Wale? Get Wale for me. Look for him everywhere. If you can't get him, get his wife. If the wife shows up, he will show up.' We all were like, albeit in hushed tones, 'Really? Does his wife now work for you? Funny though, but my boss probably knew that outside the office, if you see Wale's wife, then Wale is not far off. The whole episode got me thinking about how close I am to 'my young wife.' How much time do I spend with her? Can someone assume that if you have seen me, you have seen my wife? Hmm!!! It seems couples are more and more drifting from being hand-in-hand to individuality, and many reasons can be adduced. 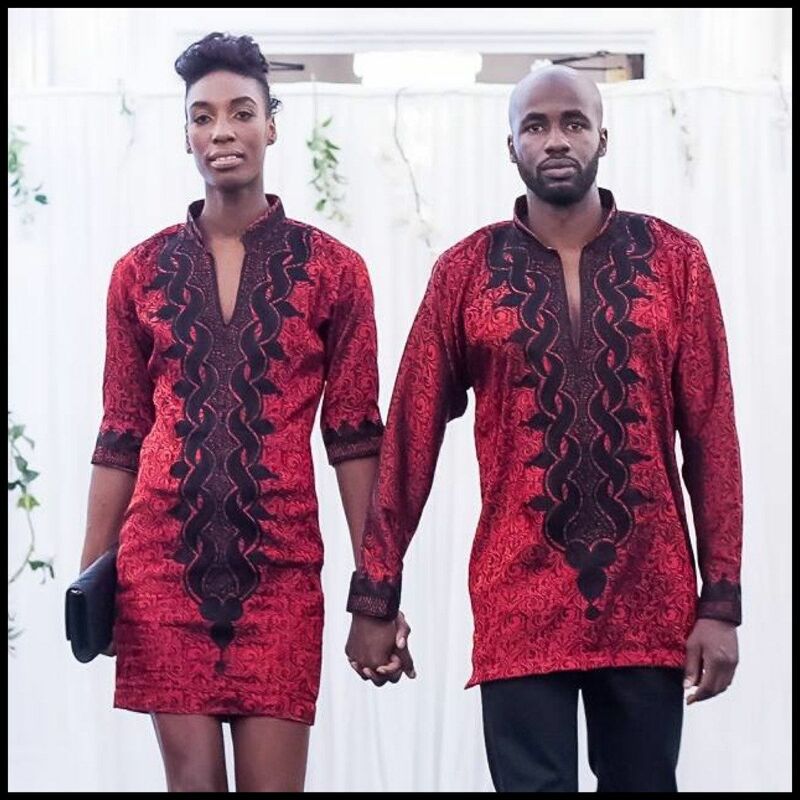 But ask yourself, when last did you wear 'and-co' with your spouse? 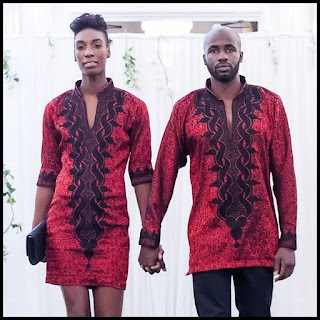 In Warri, when a couple dresses in matching outfits, it is called 'and-co.' By the way, 'and-co' means 'And Company.' While 'Aso-ebi' is for a group, 'and-co' is for a couple. In South Korea it is called Kou-peul look. If you ask me sha, I would rather favour a coordinating outfit rather than 'and-co' because matching outfit makes you look like two members of a sports team or traditional choir group. The question is, when you are out with your spouse for an occasion , do you dress 'and-co' or in a coordinating outfit, go in the same car and lock hands while walking? While for some, the score will be one or two out of three, for many it is zero, because they love their individuality and enjoy the company of themselves. It may seem that those that scored zero are not proud of their spouses. Maybe and maybe not. For some couples, they are at their best when away from their spouses. They like to fly solo both socially and spiritually. I know of a man and woman in church that for years I never knew were a couple. They come to church in different cars and at different times and sit in different section of the auditorium. Don't get me wrong, their relationship is stable but just that they like doing their own things. Their individuality when in public is deep and I wonder why. I have realized that many couples, rather than spend more time with their spouses, are now living in splendid isolation. From experience, I know it is bliss to be closely connected with your spouse to the point where, like my former boss thought, wherever and whenever you appear, your spouse is by your side or not far away. No wonder Jesus said in John 14:9, 'Have I been so long time with you, and yet hast thou not known me, Philip? He that hath seen me hath seen the Father; and how sayest thou then, show us the Father?' Please, to every 'Philip' around me, be informed that if you have seen me, you have seen my wife and vice versa. For now, it's time to head to church with my wife in the same car not dressed in 'and-co' but in a coordinating outfit. Tomorrow, our children of school age will be returning to school after about two months of being at home for summer holiday. For some, these past two months have been very difficult because they have had to manage the excesses of the kids, a role that they are very happy to hand over to teachers and house parents in boarding houses from tomorrow. While many are happy that schools are resuming, they are, on the flip side, wondering how to raise the money to pay the school fees of their children. Someone might say, 'why should anyone struggle to pay the school fees of his children, afterall, it is not an emergency? They should cut their coat according to their material.' Hmm!!! You might be right. While it is true that some can afford to send their children to Children's International School (CIS), Lekki Lagos, where you have to pay an acceptance fee of N2 million and yearly tuition of N2.5 million for nursery and N3 million for primary school, there are many who can't afford the N10,000 for some private schools. Yes, there are many that have no stress whatsoever to pay between N5 million and N7.5 million per year for their son or daughter to attend college at CIS or BIS (British International School) Lagos, yet some can't afford to buy school bags or books required for their kids to attend the free public schools. 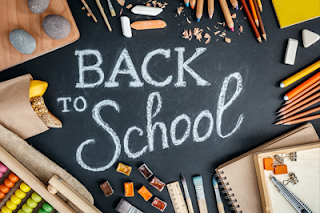 Don't kid yourself, not everyone with children in public schools will be able to afford what is required to send the children back to school tomorrow. It is not about the fees but about your financial condition and consioucs planning. Only yesterday, Iread about the youthful looking traditional ruler of Oke Ila Orangun, Osun State, Oba Adedokun Abolarin saying, 'The fear of children school fees has made me not to seek more Oloris.' Think about it, if the rich are afraid of school fees, why does the less privileged care less by having too many children than they can afford to train? Your guess is as good as mine. Tell someone that can afford it, 'Happy School fees Week,' and he will say 'thank you,' but tell a parent that is yet to pay the fees of his children same and he will give you that look that the lame man gave to Peter and John in Acts 3:5. I imagined whether it really will be happy for many parents. According to UNICEF, Nigeria still has 10.5 million out-of-school children (the highest in the world), with 60% of that number in the north. While UNICEF acknowledged that Primary school enrolment has increased in recent years, they also said that many of those that enrolled will drop out of school early. Why do you think that is? Methinks, it is because many parents do not plan for the next tranche of school fees and some gamble with it. They wait until it has become an emergency. Imagine the new yesterday of one William Williams that won N9.7 million on sports betting platform BetKing. While celebrating, he said 'BetKing has contributed to paying my children school fees this session.' really? So you have to gamble to pay school fees? Hmm!!! However, there are many that don't gamble and believe me, they planned, but hings did not just add up and they are in a dilemma. Their kids may drop ouot of school because they can't afford the school fees. Hence I see 'Happy School Fees Week' as a soothing prayer for all those sending their children back to school tomorrow. Happy Sunday and Happy School Fees Week. Labels: About school fees and seasonal greetings. I was thinking this morning..... about the smell of pride. If asked to describe the smell of pride in one word, what would it be? While most people would think of words like noxious, purulent, putrid, sour, stale and even mephitic, I doubt if anyone will associate pride with fragrance. It immediately occurred to me that, that wasn't the first time I was reading the phrase 'Na dem dey rush us.' As a matter of fact, I have been seeing it in social media of recent but never bothered to dig until now. Where exactly did that phrase come from? 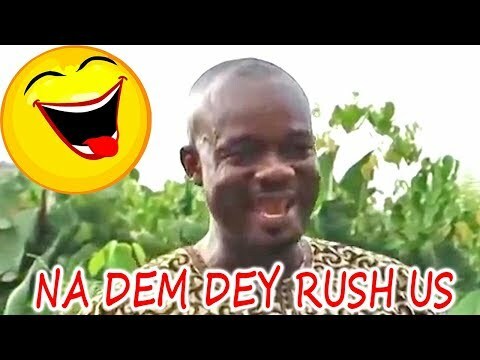 I found out that 'Na dem dey rush us' was a phrase used by Charles Onojie (popularly known as Lucky Johnson of The Johnsons comedy soap) in a movie. He had said while hitting on a lady, 'Fine boys like us, we no dey too follow women like that. Na dem dey rush us.' Since then, 'Na dem dey rush us' has gone viral. Trust Nigerians in the social media space. While pondering on why OBJ will use a social media slang to make a serious political point, I realized that any time I am tempted to jokingly say 'Na dem dey rush us,' something reminds me to think again. Why? The phrase to me looks like pride soaked in fragrance. Dem dey rush you today, what about tomorrow? Think about it. We say this regularly, but maybe not with the same words. You are young, enterprising and savvy and employers are falling over themselves to head-hunt you. On one occasion, you received offer letters from four different multinational companies. You went to church to testify and you were tempted to say, albeit in your own words 'Na dem dey rush me.' Selah (pause and think), it might be pride masked with fragrance. Your child is done with secondary school and after taking the final exams, many Ivy League universities within and outside Nigeria have granted him admission. You are so proud of his performance that while speaking to your friends, you are tempted to say 'Na dem dey rush us.' Hold back and think again, it might be pride covered with fragrance. Just be humble and be thankful.